Confession - I like my sleep. I am guilty of a lie in whilst my kids make themselves breakfast (and a mess in the kitchen). Rising with minutes to spare, I frantically yell orders to get ready for school because they are sitting in their pyjamas, eating porridge and spaghetti in the lounge room, watching tv. I have tried disconnecting the aerial so the tv doesn't work - they put on a DVD. I even unplugged it completely, but being kids of a technological age, they put the cords back in their holes and within seconds, were happily mesmerized by the cartoons, oblivious of my foiled terrorist attack. But I am mum, I am smarter! 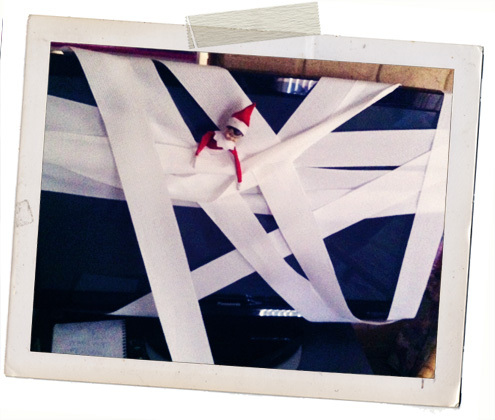 Last night, Charlie wrapped the tv, and some of the lounge room in toilet paper, cunningly obstructing view of the hypnotizing screen. The girls know the rules, Santa's instructions were clear, "you must not touch the elf". Kids 0, mum 1 (I am starting the tally today so I look like I actually have some control over these children). I went to sleep feeling powerful and devious. I had outsmarted the enemy, won the battle. Yes, but no. I did not think of everything! The little ratbags, (that is the cute but sometimes drive you crazy kind if ratbags), woke us at the crack of dawn to inform us of the mess Charlie had made! Crap. I now believe a sleep in, fed kids and a messy kitchen is waaaaay better than an early morning gaggle of girls bounding into your bedroom at day break. Lesson learned - choose your battles. Kids 1, mum 0.